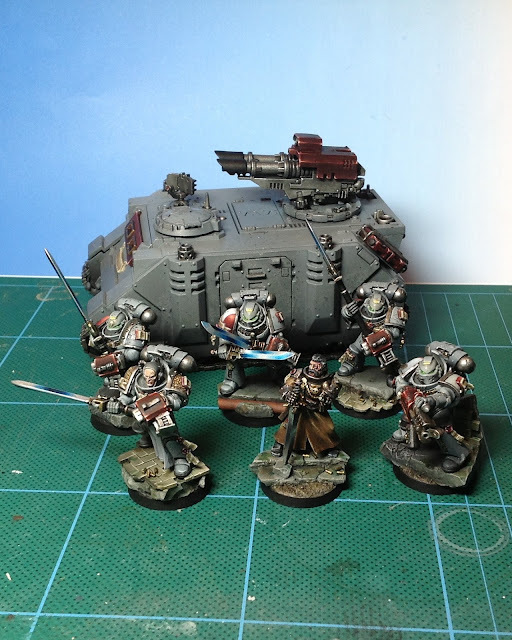 250pts of Grey Knights and their Inquisitor – painted in one month. There are a few bits I could still tweak, but I am happy with how these have turned out! I’ll get some proper photos soon, but here they are for now. Superb they look to top job! Sweet, well done! What’s up for next month?Do you think you could have done it without the airbush? Are you still enjoying the experience of doing this? Thanks guys :)This month I have 5 GK Terminators to do… thats it… 250 points! But I also intend to add in a Jokaero for fun – I can either go over points or remove some options from the terminators.Time-wise, in that last day, I think it would have been tricky to get the grey so smooth on the tank without one. It certainly saved me from failing 😉 and I am still enjoying it a lot, and learning too, which is a large part of what I am trying to achieve. Yeah, me too! Thats also the point it becomes a game-legal 500pt army. Not built an army in a very long time ;)I’ll get up somne pics of the terminators in the not too distant future!